Apple Tablet Rumors: They're Baaaack! Just when we thought the Apple tablet rumors were all behind us, they are back with a vengeance. A bevy have popped up since Steve Jobs unvieled the iPad. Some rumors suggest future products like an OS X-like Apple tablet, a camera slot for the iPad, and a Chrome OS tablet user interface. Let's break these speculative tablet dalliances down one by one. If you weren't satisfied by Apple's offering of the iPad, basically a large iPod Touch with a few extras, then get ready for the possibility of a MacPad, according to anonymous sources who spoke to TechCrunch. This rumored tablet would purportedly run off an Intel chip, and a touchscreen that could be as large as 15.4-inches (diagonal)--the same size as the 15-inch MacBook Pro. 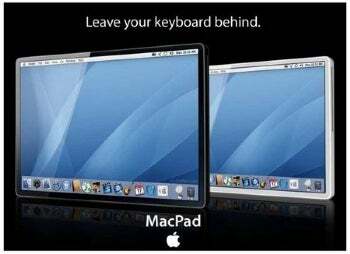 The rumored MacPad would not necessarily run a full-fledged version of OS X, but its operating system would be closer to OS X than to the iPhone OS. TechCrunch is guessing we might see hints about this device as early as this year's Worldwide Developers Conference. There have been rumors that Mac OS X 10.7 could be introduced at this year's iteration of Apple's third-party software developer forum. If Cupertino does launch 10.7 this year, and it emphasizes a touch-based interface, watch out. However, there are also rumors about a 22-inch touchscreen iMac coming soon, so keep in mind that tablet rumors could just be crossing streams with rumblings about the new iMac. One of the biggest complaints against the iPad is its lack of an iSight Webcam making video chat impossible. It turns out that Apple may have been thinking about including a Webcam, but ditched it at last the minute. 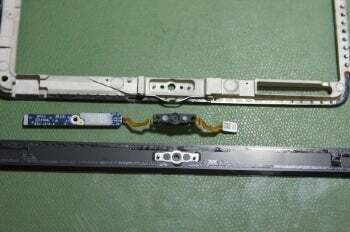 Mission Repair--an electronics repair shop in Olathe, Kansas--reported on its blog that the shop recently got its first batch of iPad spare parts. Lo and behold, an internal frame for the iPad happens to have what looks like a slot for a Webcam. Not only that, but MR says they tried placing a MacBook's iSight camera in the iPad frame, and MR says it fit perfectly. So is this proof the iPad was supposed to have a camera? Well, let's bear in mind the spare parts are likely coming from third-party suppliers in Asia. These companies have led us astray before with rumors of a front-facing camera for the iPhone and an iPhone Nano, but third-party suppliers also gave us a sneak peek at the casing for the latest version of the iPod Nano. Before taking this rumor to the bank, I'll be interested to see if companies like Rapid Repair, that typically release component breakdowns of Apple products after the products hit store shelves, also find this Webcam slot. This one's not so much a rumor as a concept, but there are some interesting illustrations and videos sitting on Google's Chromium site for developers detailing a possible Chrome OS user interface for 5-to-10-inch tablet devices. 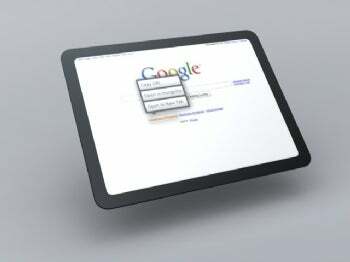 The tablet concept shows a touch-based user interface with a virtual keyboard, possible multi-touch support, and the tabs would be on the side of the screen to maximize vertical screen space for viewing content. You can see more concept images of the Chrome OS UI on the Chromium Developer site, and check out the video below to see how the tablet interface might work. But keep in mind this is all concept stuff right now, and the design will likely change over time.